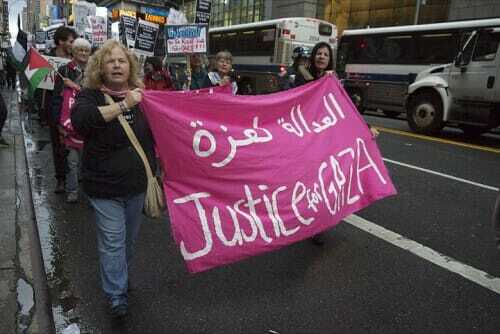 Hundreds of pro-Islamist leftists marched against Israel in New York City on Thursday. They concluded their march at the United Nations. Let’s face it… Some people are really stupid. IndyBay reported on the rally. 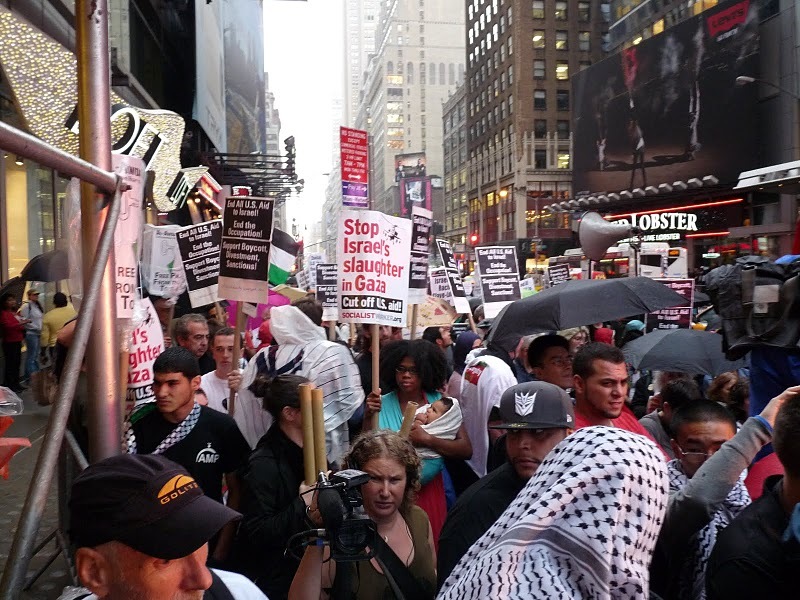 On Thursday evening, Palestinians and human rights advocates from around the tri-state area marched through the rain to the United Nations headquarters. With the world’s attention focused on the scheduled vote for Palestinian statehood, demonstrators converged to demand sovereignty, equality for Palestinian citizens of Israel, and the right of Palestinian refugees to return to their homes, in accordance with UNGA Resolution 194. 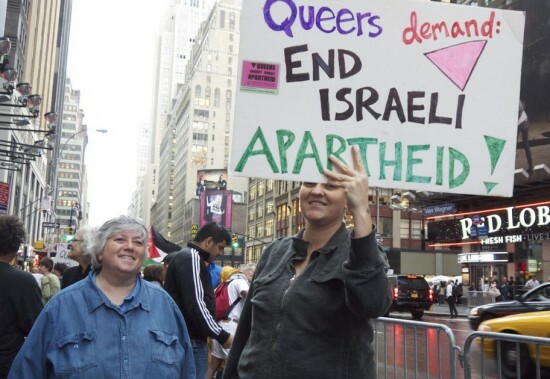 The demonstration began with a rally at 4:30pm in Times Square, where approximately 400 Palestinians and their allies braved the poor weather to chant and demand an end to U.S. aid to Israel, an end to Israel’s military occupation, and to support the movement for Boycott, Divestment, and Sanctions against Israel. During the hour, Palestinian activists detailed the demands of the community, and musicians led the crowd in Civil Rights’ era- folksongs such as “Keep On Walkin’” and “We Shall Not Be Moved.” The crowd marched down 42nd Street, chanting and singing, and up 3rd Avenue, until they reached Dag Hammarskjold Plaza. There, speakers and performers kept the crowds energy high despite cold, blustery rains. Although it appears that Palestinian leadership will submit to the UN that a state of Palestine be recognized as a member, on land making up 22% of historic Palestine, some analysts have suggested that this initiative, even if successful, will mean little to nothing on the ground in the West Bank (including East Jerusalem) and Gaza, and, furthermore, a number of respected legal experts say it may undermine other inalienable Palestinian rights such as equality within modern-day Israel and the right of return of Palestinian refugees. 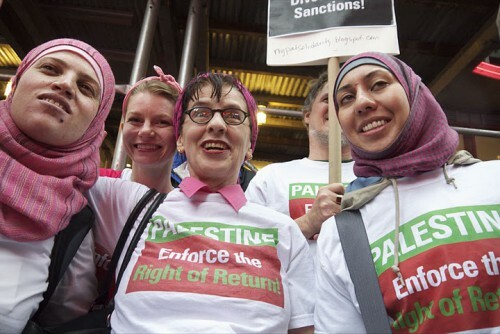 The rally and march were sponsored by the Palestine U.N. Solidarity Coalition, and was endorsed by more than 53 community and solidarity organizations, including Palestinian, Arab, Muslim, and Jewish organizations.